US and Canadian governments must petition International Joint Commission ( IJC) to mitigate matter of building nuclear waste dump near Lake Huron. The Adaptive Management Task Team is seeking input from the public on the draft Adaptive Management Plan between March 15 and April 15, 2013. Following public comment, the Task Team will revise the Plan and forward it to the IJC for its consideration. According to the Sierra Club the message heard by commissioners at the summer 2012 International Joint Commission hearings on Great Lakes water levels was “Restore Our Water Levels.” For emphasis,Canadian Commissioner Lyall Knott said, “we hear you loud and clear – restore our water levels.” But the 1,200 attendees at the hearings do not like the recommendation of the IJC for them to ‘get use to lower water levels.’ The many stakeholders – land owners, fisheries, boaters, shippers, recreators, chambers of commerce, local services to name a few – are not satisfied with this answers. Stakeholders and local governments want viable options to address the issue of lower lake levels especially in Lake Huron-Michigan where the water levels are declining far more than the other lakes even if within historic ranges. This is alarming not only to the region but our national interests. Studies have been done ad nauseum on this issue. Dredging is an obvious solution but local funds are not sufficient to undertake this task. Shipping loads dwindle ton by ton as water levels decrease inch by inch and income dollar by dollar. Evaporation is the culprit. 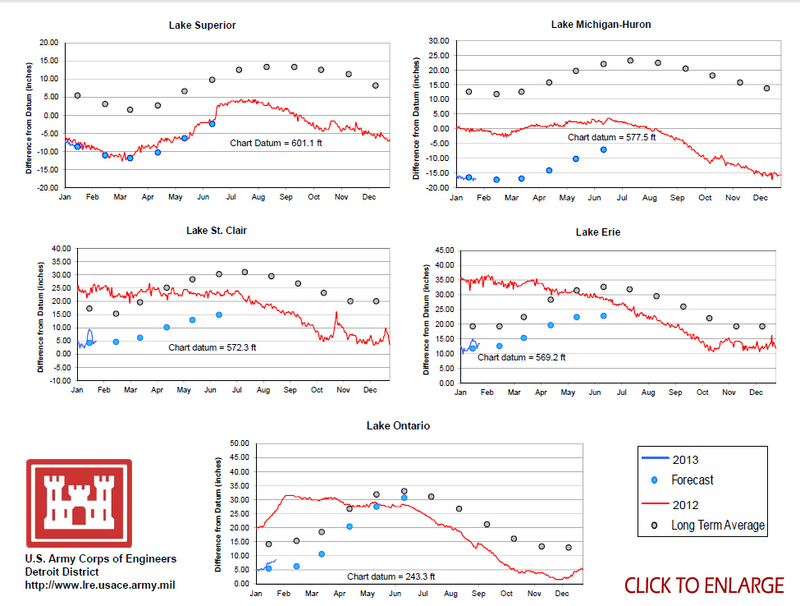 The graphs provided by the US Army Corps of engineers show the dramatic decreases and forecasts within the context of historic levels. 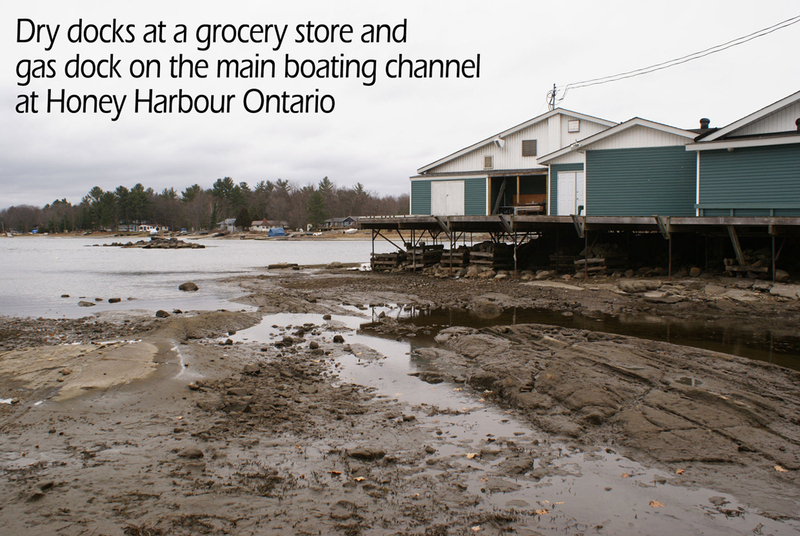 See for yourself the power of climate and evaporation in the following picture of dry docks compliments of the Sierra Club of Canda.